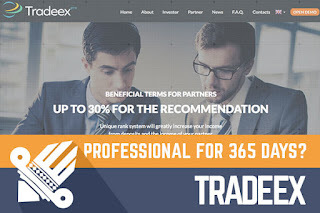 DavidNews HYIP blog - News & Reviews: Tradeex - Professional for 365 days? Tradeex - Professional for 365 days? Project from 16th of February that is listed on Golden Stage position with $400 investment is Tradeex. The project is exciting for us because investment term is one year long and the main point is that initial deposit is included in the payments. Tradeex seems quite a regular project, but I have this inner feeling that it will have investors and people will like this project because theoretically, it can grow massive. First of all, Tradeex drives attention to us with a domain that ends with a .pro, and from Wikipedia I found that this domain "is derived from professional, indicating its intended use by certified professionals." I checked, and it is not that easy to register it, but as we know everything is possible if you want and yes, administrator have such domain for this project. Overall in past years, I have seen quite an increase for domain names with different top level domains, mostly for Bitcoin-only projects, but seems that such trend has also arrived for regular HYIP projects. The second thing that I like about this project is that it is available in several languages and as you know it makes it attractive to a larger amount of people around the world. The sure thing is that not always everyone will like this or some another project, but if it is available in local language then there is more chance that you or I would invest. The third thing that I like in this project is long-term investment plan. Big bonus is that initial deposit is included in payments that are paid daily. This just means that after a year project will not have difficulty to continue because initial deposit return is one of the biggest reasons why long-term projects at the end of the term close. If we go into details of this project investment plan than it is clear that even project claims that they are paying up to 5% daily, there is no big chance that more than 1.1% will be given per day (take in mind that in the weekend you will make 1% return). In any case, if everything will go alright and you will be paid for all 365 days you will make at least 265% profit. Of course, it is nice that administrator wants to keep money in the project, but I do not like that there are immense bonuses offered for reinvestment. Sure 1% daily interest rate is not very high, and these bonuses will not compound that quickly, but you can't know what can happen within one year. Few more things - in this project, you can invest with Perfect Money, Payeer, Bitcoin and AdvCash and I'm sure that these payment options are the golden standard of today. Deposits will be accepted automatically, but withdrawals are paid manually, all times I have been paid quite quickly. I see that project is quite well accepted online and many people have invested in this project. Of course, it is difficult to predict anything out of Tradeex but for 150 days project is going on well and I believe it can continue in the same fashion. Take in mind all the risks that are involved and if you decide that Tradeex is the project for you then why would not give a shot for it. Invest only that you can afford to lose.